Oraclres see the servcrets of the universe and use their magical mikght to bring the future to the presednt. The Oracle Class Deck allows players to bringthese eneigamtic spellcstes to any Base Set. 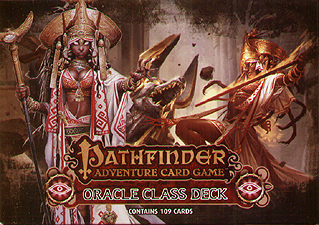 This 109-card deck contains three new characters as well as enough ne and familiar allies, spells, items, and other boons to support yur oracle through an entire Adventure Path.this deck can also be used inte popular Pathfinder Society Adventure Csard Guild organized play campaign.